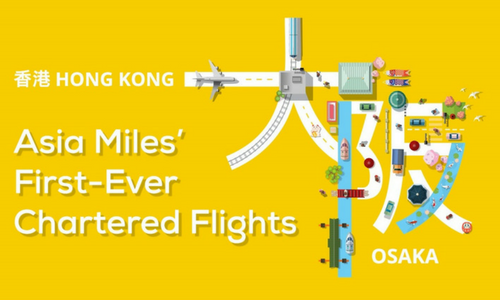 One of the region’s biggest rewards programmes, Asia Miles, will launch two exclusive flights between Hong Kong and Osaka (Kansai) for the first time ever for its members and Cathay Pacific’s Marco Polo Club members. The flight will take-off at the Hong Kong International Airport on 30 August and return to the city four days later. Members are eligible to redeem a one-way chartered flight only to fit their travel itineraries, as the latest revamp of the programme effective from late June is now set as one-way to allow greater flexibility. “Japan always tops the list of favourite travel destinations for Hong Kong people, so we’re pleased to launch the first-ever chartered flights and give our members an exclusive redemption opportunity. We wanted to give our members a new way to access flight awards to top destinations and hope our members enjoy a rewarding getaway with their loved ones,” said Paul Smitton, chief executive office of Asia Miles. Featuring Cathay Pacific A330 aircraft, members can now redeem seats through Asia Miles’ online booking system. MINISO, Chinese variety chain store, recorded significant growth in sales in South Korea, since it entered the country in August 2..